What do you mean, "it's just a car"? 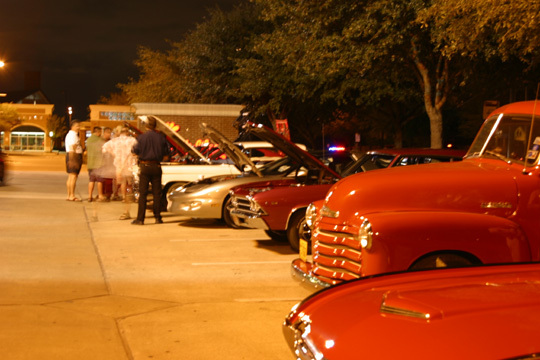 The line of cars at Cruiser Night. Welcome to Inner Loop Cruisers! We are an informal group of car enthusiasts who meet every Saturday night (weather permitting) at Chick-Fil-A, Holcombe at Buffalo Speedway. We usually arrive about 7 P.M. All makes and models are welcome. We display our cars at various shows every year. Our big show is AutoRama. We also participate in parades and charity events. Our group is diverse and come from all walks of life. If there is an automotive question or problem, someone in our group will have the answer or solution. Several people in our group are photographers and regularly photograph and video tape the cars and their owners. If you give an interview on tape, you might just have your '15 minutes of fame' on one of our dvds. There are a lot people out there who have a passion for cars. We certainly do. Come and join us! Check out our new Corvette website at Inner Loop Corvettes dot com. Tammy admiring a 1972 Corvette. Taping Inner Loop Cruisers dvd. Nicole and the '77 Corvette.